Here you have my mammoth cake. This is what happens when you doctor a cake mix (meaning there is more batter than usual) and you disregard what Wilton tells you regarding the amount of cake batter needed for this size pan, and you look at forums that tell you to use two cake mixes. Yeeaaahhhh… Fortunately the cake didn’t overflow all over the oven floor as this was as big as it got. But I learned my lesson! LISTEN TO WILTON! 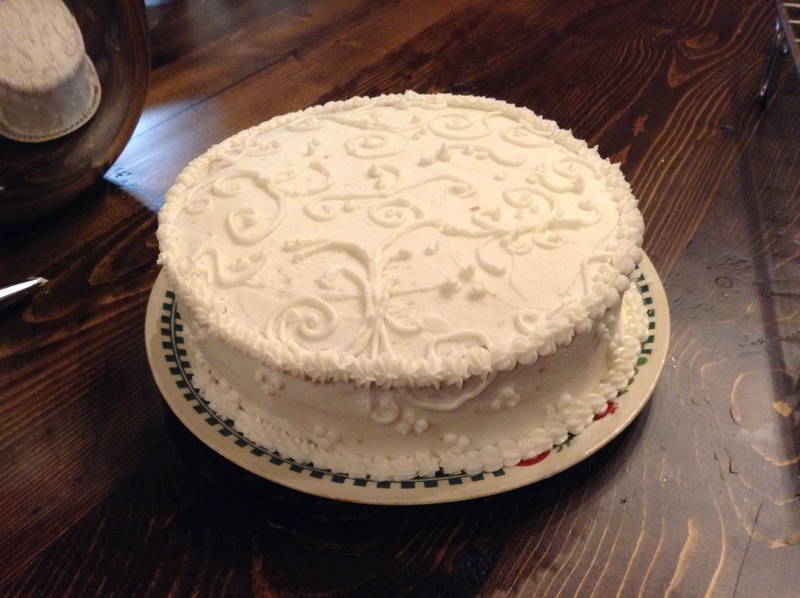 Once I made one layer of each of the sizes, I frosted and decorated as if I would the final cake. I have to say, although a lot of people liked it (we took it to church for people to eat as we had already eaten the last cake and didn’t need more! ), I felt that this version was gaudy. There were too many swirls and such. Sure, I got the shell/swirl thing down pretty good but I didn’t like it. We needed a more simple design. Thankfully, I had time to figure that out before the party. The day before the party, I spent 3 1/2 hours baking cakes. I used 6 cake mixes, 6 sticks of butter, 6 cups milks, 24 eggs, and 6 tsps vanilla. I have never baked such a masterpiece before; however I am glad it only took 6 boxes of mix rather than my predicted 9 boxes! As they cooled, I made frosting. (NOTE: I will not be sharing the frosting recipe as it is a secret family recipe that my sister-in-law created. Sorry!) Never in my life did I think that I would go through a 48oz can of Cricso; I felt as if my arteries were clogging up just thinking about it! Later that night I assembled and frosted the tiers. The next day, we headed up to the party location to set everything up. My main job: get that cake ready. When we arrived, nearly all of the family was there and running everywhere trying to help with decorating. I was told that I could work in the kitchen or out on the cake table; I chose the cake table because I did NOT want to move that cake after I finished it. However, with my choice came some nerves. You mean I have to decorate this cake with everyone watching me?! I…I do this in the comfort of my own home, after the babe goes to bed, when everyone else is in the other room watching tv, and I put my favorite music on…..I can’t do this in front of everyone! Yeah, well I had to get over my fear and just frost the stinkin’ cake. It wasn’t so bad after all and I was done before too long. The result? Voila! 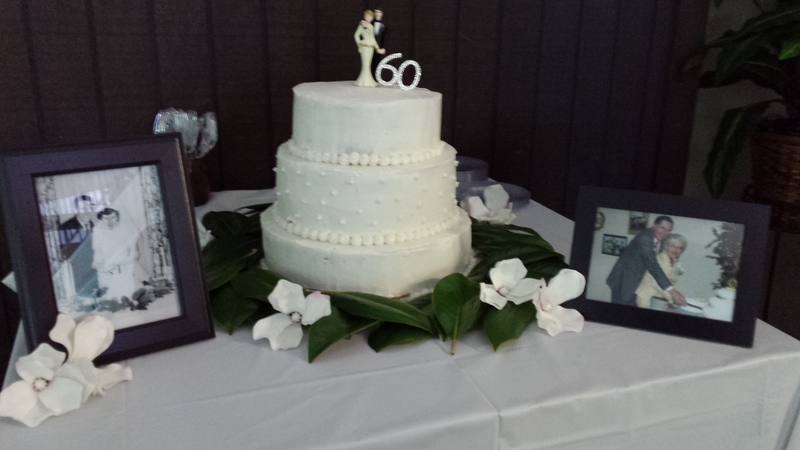 My first ever wedding cake! I was pretty proud of myself! I definitely need to practice smoothing the sides without scraping all the frosting off but I think I did pretty good. We decided that a simpler design would work best and I really loved the outcome! Lots and lots of dots. That’s it. Sigh. I did it. And I had a lot of fun too! Oh oh! I forgot to tell you: we put raspberry filling inbetween the layers too! It was so very good! It tasted like the raspberry filling you get inside a doughnut. YUM! 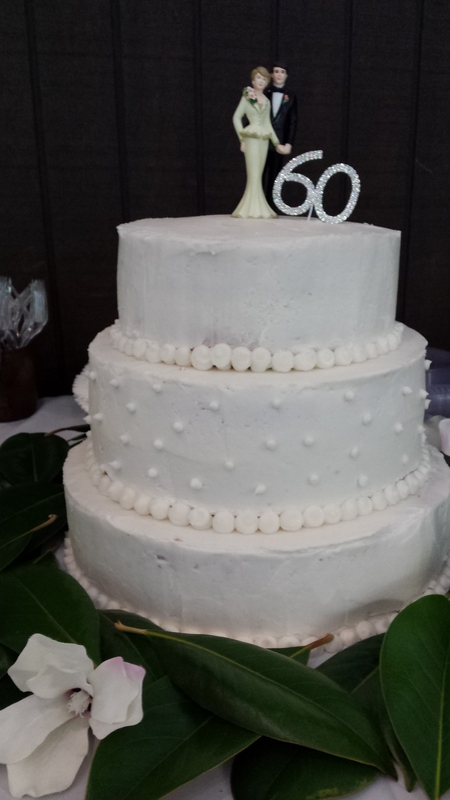 Have you ever tried your hand at a wedding cake? We would love to hear your story below! Thanks for reading, and I hope you have a super spring weekend!